Well, do you remember Malonu from previous posts? If you’ve been following this blog you’ll remember that he is from Cameroon and had recently lost his mother and now has the weight of helping to care for 14 siblings who are still in Africa. Well I gave him a call this week and set up a time to meet him. We met at 7pm at the train station. When we previously spoke with him we showed him how the study arrangement works and encouraged him to look into the Bible to find answers to his questions. One thing that is nice with Malonu is that he professes to be Christian. This means that we already have a good base of which to build on. When we last spoke I told Malonu that I would bring him a French Bible and a Teach book. 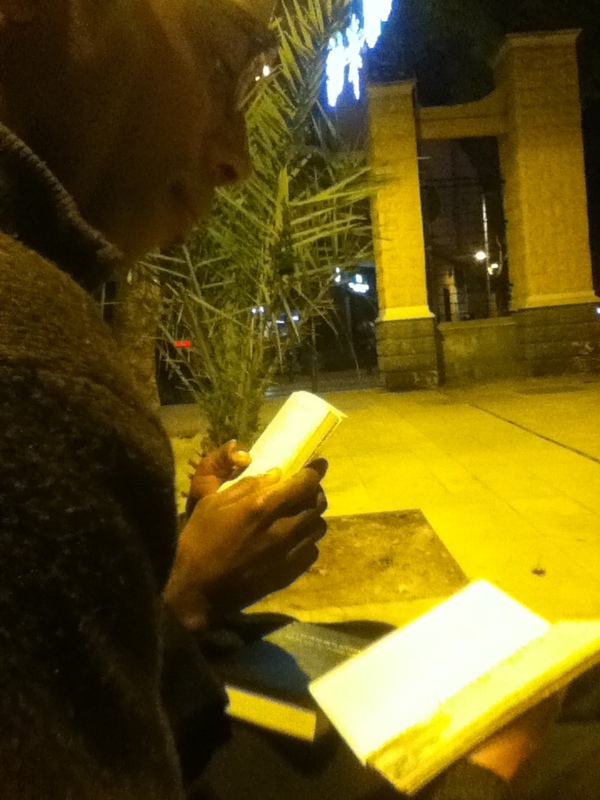 We met Malonu near the train station and we decided to walk over to a nearby plaza and find a bench to sit down on and study. Kanicia was with me as well. I gave Malonu his new books and he seemed pleased. We found a nice bench in front of a picturesque building that is used as a library. There were children playing nearby in the plaza and the typical lively nature of Spanish nights all around us. But despite this we moved forward with the study. I showed him the question and answer nature of the book again and we started with the first chapter. Malonu reads French as well which is also great. He has a lot of stress and things are very difficult for him here but he wants to find answers to serious spiritual questions. He lives in an area called the ghetto which are abandoned buildings. We studied half of the first chapter with him reading all the scriptures in his new Bible. I helped him to find the books and verses. After considering the paragraphs he asked us many questions. We decided to address one of them for the time being. He wanted to know who is God. We showed him Ex 33:20, Jn 1:18, Rm 1:20 and 1 Jn 4:8. These verses talk about how no man has seen God and also how God is love as well as how Gods qualities are made manifest through his creation. We reasoned with Malonu concerning these verses and gave illustrations to help him see the point. Then we read Psalm 83:18 which reveals that God’s name is Jehovah. As he read the verse I was starting at him to see his reaction. He paused for a few moments after reading the verse and seemed impressed to find that verse in the Bible. It was a privilege showing someone God’s name in the Bible for the first time. I am very please to have my first study and I can see that there could be many others in the not too distant future. We have another appointment with a man on Saturday. If you remember from previous posts he is the man who approached us out of the blue and took a publication and gave us his number. We couldn’t find him home because he actually had moved to another area nearby. So we will let you know what happens. We are starting to feel comfortable in the ministry here and I have many calls and it is very easy to find people to talk to. As many of the men come from a Muslum background at times it is challenging for Kanicia or other sisters to make progress with them. Sometimes the more strict Muslims will just entirely ignore a women that is speaking to them. But despite these challenges we are finding ways to be productive. Oh yeah and the cards that we had made are a great tool here in the ministry and we are so happy to have them! Spain LOVES the New English Bible!